Trouble with London’s new Orpheus. 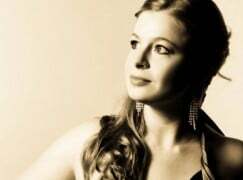 Mary Bevan who was due to star in Luigi Rossi’s opera, which opens tomorrow, has a throat infection and can’t sing. So they are flying in the Australian coloratura soprano Siobhan Stagg, whom Christa Ludwig has the loveliest voice around. Siobhan, 27, will sing from the gallery for the first two performances and on stage for the next four. She hasn’t got that far to fly: she’s a member of the Deutsche Oper, Berlin. We wish Mary a swift recovery. Heard her sing from the gallery at the dress rehearsal and very lovely she was too. A rarely performed opera – and Covent Garden doesn’t have a cover for Mary Bevan? How bizarre! Or she was the cover? Major opera houses generally have two covers: one established backup plan at a few hours’ notice (in, say, Berlin), and a lower-level on site cover. In the case of the ROH, the Jette Park young artists generally act as covers. That being said, one can understand that the ROH would prefer putting on stage an established singer rather than a young artist in development. Aussies have long known the beauty of her voice. We are very proud of her and thrilled at this opening for further exposure.